Bald Eagle Attacks An Osprey Nest In Captivating Video : The Two-Way Rare video footage from Maine shows how resurging bald eagles prey on other species. The good news is that two out of three osprey chicks survived. 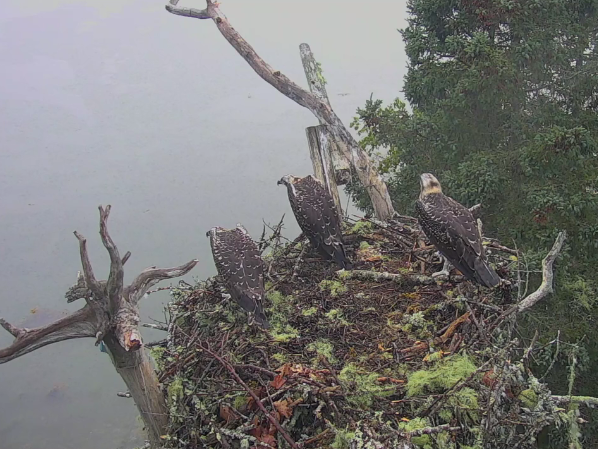 Hog Island, Maine, osprey chicks await their parents' return. Seconds later, an eagle makes off with one of the nestlings. The video was recorded Tuesday by the National Audubon Society's live explore.org camera focused on an osprey nest. Three young chicks are calmly resting. Fans of the live cam know them as Eric, Little B and Spirit. Both of their parents are momentarily away. The video shows how, in less than four seconds, a bald eagle swoops in. Little B takes flight (for the first time). Eric ducks and tries to look small. But Spirit is less fortunate as the eagle snatches the young osprey and flies away in a single motion. One osprey parent arrives on the heels of the marauding eagle but it's too late to prevent the attack. Eric and Little B survived. "It's one of the best videos I've ever seen of eagle predation," said Steve Kress, vice president for bird conservation at the National Audubon Society and director of the Audubon Camp on Hog Island. As Maine Public Radio's Fred Bever reports, as the eagle population in his state recovers, the powerful predators are an increasing threat to other bird species, such as cormorants and blue herons. "Call it conservation blowback: Since the 1970s, when the pesticide DDT was banned and the Endangered Species Act took effect, the emblematic American bald eagle's population has roared back from near-extinction. But more eagles need more food, and for some other struggling bird species — here in Maine and around the country — the eagle's success story has a menacing side."